This pretty and finalized design Tekken 6 machine comes with 32" HD monitor with 720p output. Some new characters like Leo, Zafina & Miguel ... join the fight. New features includes: multi-tiered fighting arenas that can change from day to night, Character customization makes a welcome return with of course more items to make your fighter unique. The music tracks in Tekken 6 are very energetic and upbeat, this is going to be the best looking 3D fighter ever. 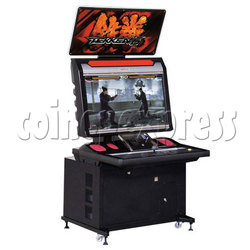 Notes: Arcade game Tekken 6 kit is available.